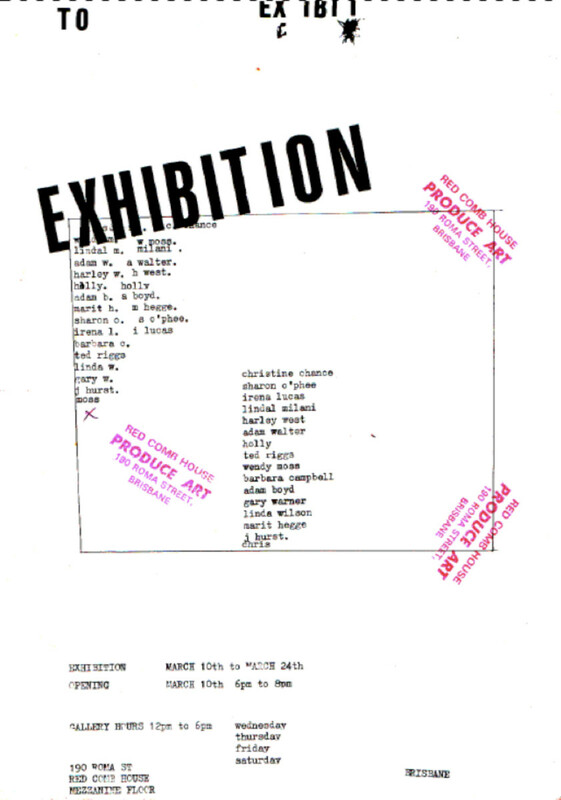 Produce Art Collective formed in March and April 1982 inspired by the Produce Art group exhibition 10-24 March, 1982 an exhibition of 16 artists curated by artist Jeanelle Hurst. Red Comb House was a short term artist-run in the old produce stores located in Roma Street. This artist-run was one of many spaces earmarked for demolition and available only for short-term rentals in the inner city 4000 postcode during the 1980’s. Red Comb House initiated by Jeanelle Hurst. Artists paid monthly studio rent. Produce Art Collective artists including Linda Wallace, Barbara Campbell, Lyndall Milani, Brian Doherty, Hollie, Adam Wolter, Christine Chance, Russell Lake, Jeanelle Hurst, Adam Boyd, Harley West, Chris Anderson, Gary Warner, Ted Riggs, Linda Wilson, Irena Luckas, Sharon O’Phee, Marit Hegge, Harley West, Wendy Moss (Mills), Gary Warner and others. Red Comb House, 190 Roma Street opposite (then) Police Headquarters. Artist-run in inner city precinct, affordable rental for studios.